** spoiler alert ** In the summer of the second year of the Great War, British and French troops mounted an offensive against the Hun along the Somme River in northern France. The Germans had been entrenched for the previous two years and were solidly fortified. Charge after charge by mostly British troops (many of the French were redirected to fighting at Verdun) amounted to no more than a few hundred yards of real estate after the first two months. With the remnants of practically an entire generation of Great Britain hanging in the balance, a last ditch effort was mounted to make a decisive break-through in the late summer, with a "secret weapon" up their sleeve - the tank (the name "tank" was used so to start the rumor that the metal monsters were merely water tanks). Though only four of the original forty to fifty sent into the field made it to the front lines, the result was smashing. The sight of these noisy contraptions scared the "dickens" out of the Germans who fled to their rear. The British advanced two miles through the German lines within a few hours, making more headway than the previous three months and with a small fraction of the usual number of casualties. 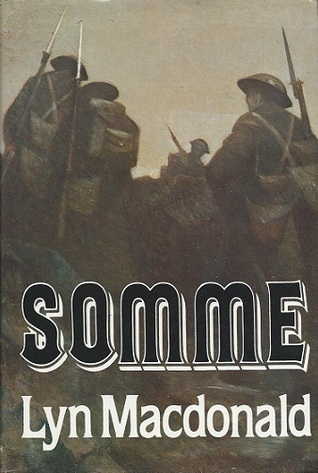 Sign into Goodreads to see if any of your friends have read Somme.